On the northern shore of Massachusetts Bay in eastern Massachusetts, the City of Lynn is home to approximately 90,000 hard-working and culturally diverse people. This commercial and urban manufacturing center is the largest city in Essex County and sits just nine miles north of Boston on the Atlantic Coast. At the heart of the city is its Downtown Lynn Cultural District. Here the art is unique, the food is exceptional, the culture is rich, and the people are friendly. From the majestic beauty of the Atlantic Ocean to the historical Lynn Auditorium, this fabulous city had no shortage of exciting things to do and see. In Central Square, there are more than twenty mouth-watering restaurants serving up diverse, authentic fare. Among the favorites of Lynn residents, are Pho Minh Ky, Charlie’s Junction Deli, the delicious Venezuelan cuisines of Los Chamos, and Capitol Diner. The Salvadoran pupusas of Tacos Lupita are divine, Casa Antigua is dishing up exceptional Guatemalan delicacies, and CM Bistro has refreshing smoothies and crepes. Other favorite hotspots include Rossetti Restaurant, R.F. O’Sullivan’s The Blue Ox, Thousand Hills Coffee Company, and Bent Water Brewing Taproom, to name a few. 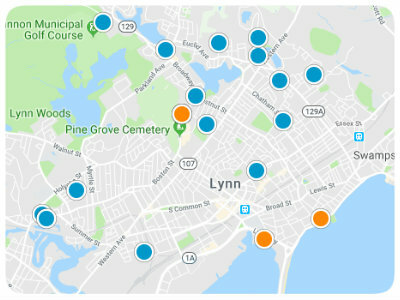 In addition to the ethnically diverse dining opportunities, Lynn boasts the “ART WAY” Union Street tunnel, the Raw Art Works installation, and the photo project called “Ghosts of Lynn.” Other popular arts and cultural destinations include the Lynn Auditorium, the 110-year-old Lynn Museum, and LynnArts. The Lynn Museum was founded in 1897 and preserves the city’s long history in the center of the Lynn’s Arts & Cultural District. Since its inception, this thriving cultural hub has expanded and evolved and today encompasses the LynnArts building found at 25 Exchange Street. LynnArts provides studio space for artists of all mediums, as small as 60 square feet, up to 170 square feet. Lynn Museum/LynnArts continually offers innovative programming for the young and young at heart with nearly 10,000 artifacts and rotating exhibits. The Museum was once located on Green Street in a residential building but is now located at 590 Washington Street. The other alluring feature of the Arts and Cultural District of Lynn is its convenient accessibility by public transportation and car. Furthermore, it is a short twenty-minute train ride from Boston, and once you arrive, you’ll find all the hotspots are within walking distance. Additional points of interest in the city include High Rock Tower and Observatory, which offers spectacular views of star clusters, Saturn’s rings, the moon’s craters, Jupiter, nebulae, and galaxies, and The Grand Army of the Republic Museum which has on exhibit memorabilia from the Korean War back to the Revolutionary War. If you are a prospective homebuyer in eastern Massachusetts, consider the homes for sale near Lynn’s Arts and Culture District. Real estate near the Arts and Culture District is diverse and falls in a broad price range. If you would like more information regarding available properties near the Arts and Culture District, please give us the opportunity to assist you and contact us today.